For retail, delivery, warehousing and stock roles or portering duties work trousers are usually a standard part of the uniform. Even IT staff will need several pairs in order to carry out their work safely, given that they spend time moving out or fixing broken computers or installing new ones as well as answering helpdesk calls. 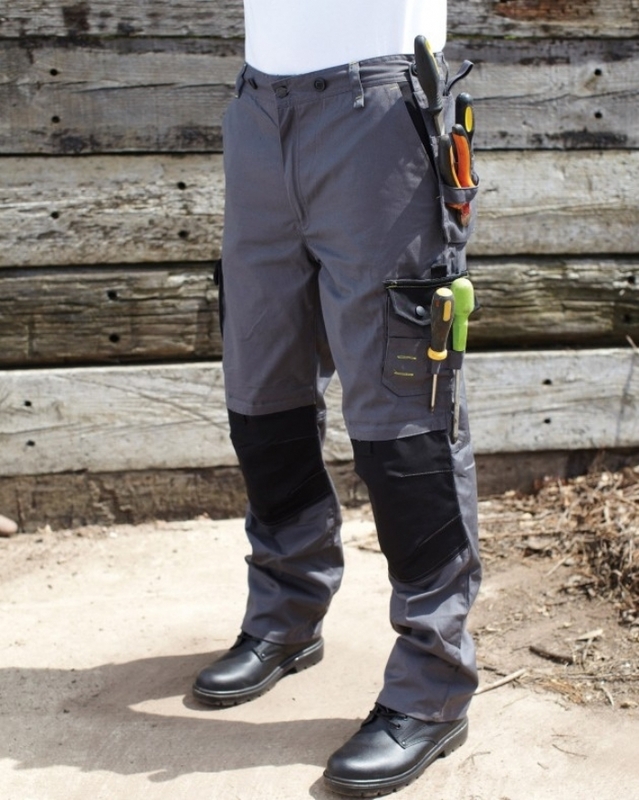 Work trousers with knee pads or knee pad pockets are often used by those who spend a lot of time working at floor level in the course of their job. They ease the wear and tear on the trousers themselves and provide protection for the wearer’s joints. Many IT and other installation staff, flooring fitters and carpenters will wear them regularly. Chinos, cargos, carpenter’s trousers and camos are all popular choices for work trousers in the UK. The type of work trousers that staff can get away with wearing depends on the dress code of their company and the terms of their employment. Generally fixed term or permanent staff will receive a uniform once their contract is confirmed, and may be expected to sign it out of stores and return it at the end of their contract. Work trousers are often a cause of great dislike, as many are by necessity shapeless, baggy, and for the shorter staff members, often too long in the leg by several inches. Whatever the staff members’ personal views, their work trousers must be hard wearing and able to cope with both the rigours of daily wear and repeated washing and drying. For these reasons they are unlikely to be high fashion items, although they can still look smart as part of a uniform. Some employers will allow the replacement of standard issue work trousers with similar from the High Street if the employee can demonstrate that those provided are not suitable. Here at Aston Workwear we have a range of work trousers for men and women. Customers can choose from disposable non-woven work trousers, a selection of hi visibility trousers in orange or yellow and waterproofs of various weights. Our Tuf Revolution polycotton cargo work trousers with knee pads are available in sizes from 30" to 48" waist and cost under £30 a pair, while a pair of BlazeTek flame retardant work trousers for men are only a pound more expensive and come with the addition of a special flame retardant treatment. Whichever variety of men's work trousers you need, we have your requirement covered. Remember, if you can't find what you need, your Account Manager and our customer service team are only a phone call away. Why not take a look today and see what you can find?